Today my ballot paper arrived for the Scottish Referendum. It felt a special day. Tomorrow I’ll vote Yes to Scottish Independence and send it off. I’m voting by post because on the 18th September when the Referendum actually takes place I’ll be on the Isle of Harris climbing Clisham with a group from the Mountain Festival. Being on a Scottish mountain that day somehow seems appropriate. Voting in this Referendum feels like one of the most significant political choices I’ve ever had. A Yes vote really could change things, and not just for Scotland. I’ve never had great expectations when voting in elections – general, Scottish or local – and have often voted for what seemed the least bad option. This vote feels different. So why am I voting Yes, something I knew I would do as soon as a referendum was first mooted? 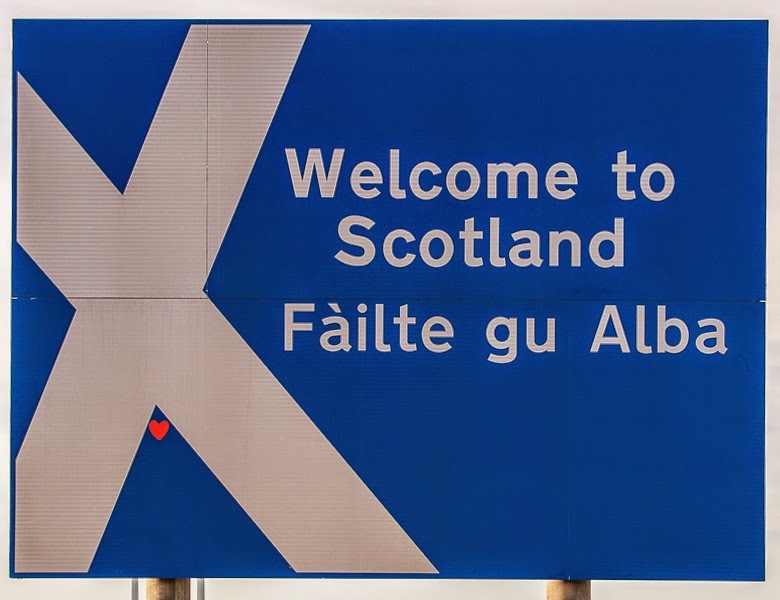 I’m not from Scotland, I’m from England, but I’ve lived in Scotland for 25 years and it’s home now. I feel I belong here. I’m not a nationalist though. I’ve always liked the address John Muir wrote in his notebook – “John Muir, Earth-planet, Universe”. I’m voting Yes because, whilst internationalist in outlook, I also think decision-making and political power should be as close to people as possible. My political views are decentralist, democratic, egalitarian, libertarian. The standard straight-line left-right spectrum is too narrow to express this. One of the best methods I’ve seen for doing so is The Political Compass, which has two axes - authoritarian/libertarian and left/right. I’m down in the bottom left corner – libertarian and left. How this political position relates to the Scottish Referendum and what it entails has been expressed well by Andy Wightman in this blog post. I don’t see narrow, separatist nationalism as being part of the Yes campaign – I would be worried if it was - but I do see it growing in Westminster and England with the rise of UKIP and the move towards anti-European and anti-immigrant positions in the other parties. I want to be part of a country that looks out to the world and wants to be part of it not one that wants to close the doors and shut the world out. I think a Yes vote could open the way to a different sort of politics, one that is more participatory and more involving. The many strands of the Yes Campaign – despite what the mass media tends to say it’s far more than the SNP and Alex Salmond – have encouraged these thoughts as there has been a great upwelling of ideas, a great feeling of community. Whether the vote is Yes or No, whether politics returns to ‘normal’ or not, I can’t imagine this energy and involvement simply disappearing. And even if there is no big realignment after a Yes vote and Scottish politics continues its party political way changing things will be easier and power will be closer than in the UK, where Scots only make up a small percentage of the population. I think too that the Scottish electoral system is already more democratic than that of the UK. No House of Lords and a form of proportional representation ensures that. Some, I know, will say that I’m being idealistic, that it’s safest to stick with the status quo and not take any risks. Idealism is good is my reply. Without ideals how would any progress be made? And the status quo is a mirage. Whatever happens things will change. It’s a question of how much control we want over the changes and how much we’re happy to leave them in other hands. I like being independent. I want my country to be independent. As to risk, well I’d never have undertaken all my outdoor adventures if I was averse to risk. I’d probably not have done them without being idealistic either. Also, is independence any more risky than staying in the Union? I don't think it is. Having less control over the future is hardly a safe option. I think a Yes vote will have much wider repercussions too. Scotland won’t just exit the UK, leaving the rest to continue as usual. Others in the UK will look at the centralisation of power and wealth in the London and wonder if they too can break away. Declining numbers of votes at elections shows disillusion with a degenerating and corrupt over-centralised and over-big system. Scottish independence could be the trigger to change this for the benefit of all in the UK or at least set an example for others to try and follow. This is a time of optimism and the potential for positive change. I hope enough of us vote Yes to make it happen. Totally agree with you points here Chris, the times I have said to friends and family that this is about Scotland, Not Alex Salmond. I am not a nationalist, and have been in business for over ten years here, independence doesn't worry me in the least, in that respect. Control of your own affairs is crucial for any business or organisation to flourish, in my opinion. I have seen both sides of the argument, having lived in South East England for 15 years on and off. Reasons for moving, quite simply a better standard of living, nearly double of what I was earning in Scotland. Most of the construction work and development was being ploughed into the South at the time. A point that is still true today particularly in London take a look at the skyline and it's dotted with high rise cranes. We always seemed to be the poor cousins when it came to investment. Like yourself if you don't take educated decisions or risks at times it becomes what if. Having suffered a stroke over 10 years ago, I was advised to stop going into the mountains, being a stubborn bugger, I decided to prove everyone wrong, and it was my love of our mountains that gave me back my health and a new outlook on life. I just hope that this could be a new start for Scotland and it's people. That's the most utopian view I've heard yet. Essentially it says do nothing but work for world socialism. In the meantime the world goes on and decisions have to be made now. We are still rehashing the same ideologies of the last century. You may need a party but design the structure differently to give more power to the people as a whole. Of course money is first. so have a state bank so all profit from loans and commerce with stay in state and be used for service, health care, pension, social support. Be independent for food, necessity etc. do not sell your land to foreigners, or corporations, lease to them and protect it. There are many things you can do to be independent for real and still participate in trade. Do not have economy based on growth, it is impossible leads to debt. have economy based on sustainability and science, art, culture, social progress. You could be a great example for other to follow. A new government need include, young people, older people and others to be involved in decision making. Form council of elders, and for nature, science and art.Get everyone involved and then elect based on agenda you develop. I also believe there is significant political decision to made. I have been making myself more "politically" aware than I ever have for an upcoming election. There is too much, in my opinion, still unanswered to be comfortable independence is the right thing. If it wasn't already clear I am in the "No" camp. I am not adverse to risk when in the mountains but I wouldn't class myself as a lightweight hiker. I always pack for the "what if" factor. There's regularly gear in my pack that never sees anything more than the damp shadows at the bottom. And I am applying that process to my decision making. What is our fall back procedure if "hypothetically" it does go wrong in an Independent country. Depending on when this "could" happen the UK won't help us and depending on the time the EU probably won't help us either. We may have to sell our souls to what ever devil will throw a lifeline, probably giving up all our rights to the the black liquid gold the Yes campaigns using to budget an independent future. I realise this is a very pessimistic and negative outlook on what could be a "new start" for a beautiful and proud nation. I am Scottish first before any nationality and very proud to be able to say it but I am also working hard to provide a better future for my daughter, to provide her the best start she can have. If an Independent Scotland crumbles my daughter will be cleaning up our generations mess long after I'm gone. A small part of me would vote Yes to allow the "Braveheart" nation to rise but not enough to see it collapse around me. I believe that within a "United" nation we are better placed to be supported. Everyone needs supported from babies to Greece. Don't get me wrong I don't have any faith in the No campaign doing any better either but from examples of the construction of the Scottish Parliament Buildings going hugely over budget and the organisation and implantation of the capitals horrendous tram system. The future doesn't bode well! What ever the result I will still be Scottish. I think the future looks bleaker staying in the UK than in an independent Scotland. The UK is heading towards isolationism. I think there's a greater risk staying in the UK than leaving. I'm not an ultralight hiker. I always have enough gear to get me through the worst conditions likely to occur, which means I also usually have gear in my pack that sees little if any use. But if I was really risk averse I wouldn't go out at all and certainly wouldn't undertake solo long distance walks in remote wild country. An eloquent argument and a nice summing up. Just wish more people were this mature in their 'debating'. Have seen lots of friends fall out over the choice. 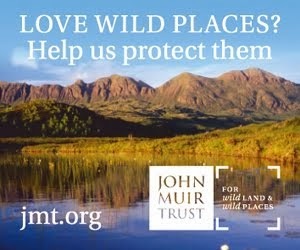 Whatever the outcome, lets hope the new wild land laws will see our hills and mountains in a much safer place. 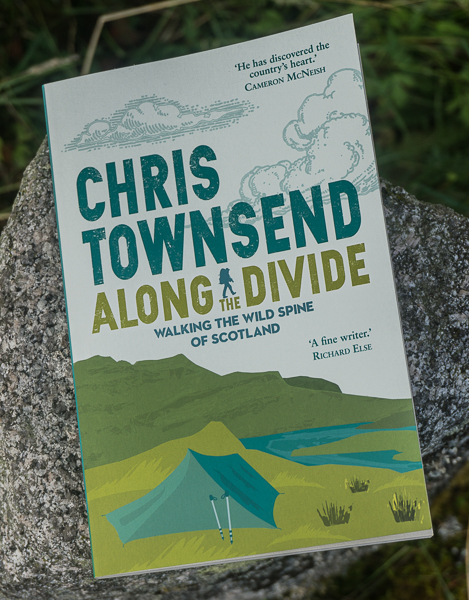 Enjoy An Clisham Chris and when the day comes, I hope you'll have a wee snifter at the top, hopefully to toast the brave new world you'll come back to! I love the LAND in Scotland. The Nationalists have destroyed more of this in a few short years than any other administration in history. The vast majority of Scots seem not to care. I find that deeply worrying. 18 months ago I stood on the summit of Meall Bhuide, above Loch an Daimh, and gazed out on the most wonderful mountain panorama anyone could ever hope to see. The first thought that came into my mind was, "Oh, what a beautiful country. It deserves to be independent." That thought was instantly swept away by this: " The Scottish Nationalists are THE group of people who have chosen to destroy this." To me, our attachment to Place is an essential part of our humanity. To dismiss that is tantamount to an admission that the land under our feet, with all its cultural and historical associations, does not matter. I cannot accept that. I love my country and I will vote accordingly - not in favour of the Union, but in opposition to a declared policy of destruction that targets what matters most to me in my life. I disagree that the SNP govt has destroyed more of the land than any other administration. Much of the damage was done before they came to power and over many, many decades - deforestation, over-grazing, over-management by big private estates, who continue to do this. Yes, wind farms are a problem and need to be fought - which I've been doing - but that will continue whether the vote is Yes or No as it's already a devolved issue. Voting No is a vote in favour of the UK. I agree that there has been much damage done by previous administrations. What concerns me most with regard to wind farms are the following three issues. Firstly, their construction entails environmental degradation on a huge and perhaps irreparable scale. Secondly, the Scottish Government has demonstrated a sad lack of regard for this country's natural heritage and that cannot bode well for the future. They've already declared where they stand. Lastly, by riding roughshod over local democracy and sticking their heads in the sand of dogma in the arena of energy and the environment they are showing tendencies that I suspect will be reflected at some stage, if not already, in other policy areas. I find that deeply worrying. And for the record, I know all too well that energy and the environment are devolved issues. I share your concerns Jane. 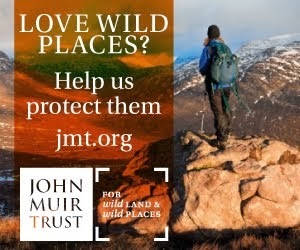 However I think recently the Scottish Government has shown more concern for the environment with the wild land map, new planning legislation and rejection of the Glenmorie wind farm - all of which I've written about in previous posts. Because this is all a devolved issue I don't think a No vote will make any difference - they'll remain in the control of the Scottish Government. Indeed I think a Yes vote might make a difference because it could lead to a realignment of political groups. But my main reason for voting Yes is because I believe that decisions about Scotland should be made in Scotland by the people of Scotland. Chris, I couldn't agree more. What worries me most at the moment though regarding the environment are the licenses handed out to the highest bidder by Westminster to allow fracking. I have read so many stories about fracking causing earthquakes and poisoning our water. We need to be in charge of our own affairs in Scotland to put a halt to plans such as these. Well said Chris. I'm proud of you! Hi Chris; thank you for your thoughtful piece, which certainly presents a much more compelling case than much of the rubbish we hear from the official yes campaign (and indeed the no campaign). The thing that concerns me though, is the assertion that one can be internationalist, and still be a yes voter. Surely, internationalists believe in people coming together, not drifting apart? That's why most progressives, liberals, socialists and environmentalists all now support the EU, despite its many failings. I fear that for Scotland to leave the UK would be to head in completely the wrong direction. Of course the UK needs reform; no argument about that. We urgently need a federal constitution, guaranteeing autonomy to Scotland, Wales, NI and the English regions (and Cornwall too, if they want it). We need to abolish the monarchy, replace the House of Lords with a senate, introduce PR for elections, and much much more. My real fear is that independence, whatever that means in the modern world, is too simplistic a solution, and worse than that, would be a missed opportunity to achieve true democratic reform on a much larger scale. That would be a real tragedy, in my view. (PS please see https://uk.news.yahoo.com/comment/talking-politics/salmond-nationalism-ugly-others-084240730.html#4J3Tdll for a more detailed examination of similar arguments). I don't think that independence means drifting apart from the world in general. I think it's the UK that's becoming narrowly nationalist and separatist. I agree with you on the EU - I think the UK could well be out of the EU soon, which would mean Scotland would be too as part of the UK. Independence on its own means nothing of course it's what is done with it that matters and the vision I see from much of the Yes campaign is positive and outward looking. Under the UK system I see no likelihood of any of the things you say need doing happening. I hope that independence for Scotland would trigger changes in the rest of the UK. I fear a No vote will mean business as usual. What an interesting debate. As an Englishman, I was surprised by what I have learnt in the media of the impact independence would have on the UK. I do think there is a risk to independence though. Whatever happened to Salmonds so called "Arc of Prosperity" with Ireland and Iceland? That would have worked out well wouldn't it? (sorry for the sarcasm). Who bailed out RBS? The oil is going to run out. be disrespectful). But looking at the economics, is independence a wise move? Of course there's a risk to independence, just as there's a risk to staying in the UK. Both are full of uncertainties. Iceland and Ireland are both doing ok now actually. RBS was mostly bailed out by the USA (http://www.huffingtonpost.co.uk/gordon-macintyrekemp/scottish-independence-bank-bailout_b_4895234.html). Whether Scotland had been independent or not wouldn't have made any difference. The oil will run out but there's plenty left at present - and I don't think we should be exploiting it all anyway for environmental reasons. Independence is about just that - independence for the people of Scotland to make their own decisions. The economic future after independence would depend on the decisions made. Points taken Chris. And as you rightly say, there is a risk whichever way the vote goes. But the Union perhaps offers a cushion as another comment on this thread said. Would the U.S. have been so keen to assist in the bailout of RBS if Scotland was not part of the U.K. union as London is one of if not the financial centres of the global economy. Without wishing to go off on a tangent, look at the West's/U.S. response to the current Russia/Ukraine crisis. As Putin knows well, actions speak louder than words and perhaps maintaining an economical link with resource-rich Russia is more important to U.S. interests than protecting smaller Baltic nations. So could an independent Scotland rely on such assistance in future? As you say the oil will run out but there is enough for the time being, but what after that? Maybe remaining part of the Union is best for all. I read about one of Salmonds public appearances that was chastised by a Scottish journalist in the Guardian for the superficial romantic history of Scotland presented set to the music from the film Braveheart (the score of which was written by an Englishman). Its such a complex and emotive issue. It should be discussed and voted for democratically and rightly so. And its interesting how northern English cities such as Manchester, Liverpool and Newcastle have watched the SNP's cause and been motivated themselves to a form of devolution with a request for £15bn to improve East/West transport connections in the north rather than focusing so much on the north/south HS2 link for example. The US bailed out RBS because it was in the its interest to do so. Whether the headquarters were didn't matter. As it is 80% of RBS losses were in its London based businesses. I would hope that an independent Scotland wouldn't have such lax regulation that a crisis like that could occur again anyway, at least not in Scotland. The debate is being discussed robustly and in detal. I haven't come across any superficial romantic history stuff. I'm not a nationalist or a member of the SNP but Salmond comes across as a hard-headed politician who knows what he's doing. Remember the SNP have been successfully running Scotland for quite a few years now. I can't see why remaining in the Union is best for Scotland. And anyway it's not about that, it's about having the right to make our own decisions and elect governments with full powers. It's certainly very interesting how northern English cities and other places in England are reacting tot he independence debate. I do think it's likely that a Yes vote will trigger changes in England too. Can't work out how to overcome the anonymous bit! this is by Roger Webb. Freedom of a country does not necessarily equate to freedom of the individual, and in the proposed constitution I see no checks or balances at all. Just centralised power. Sorry for the rant I shouldn't have got on my soapbox . Roger, sorry for any confusion re "anonymous"!!! I can see that my posts could be confused with yours as I too posted as " anonymous ". In future I will post on the internet under " anonymous" but sign off with another identity. You made some very interesting points, Roger. This has been an informative thread/discussion and thanks to Chris for providing this platform and all that contributed. Roger, I feel that maybe you and I are on the same wavelength when you say be careful what you wish for. Idealism is one thing, but reality is another? Chris, I think you are right to want independence. I am from northeast England and would vote any day to get away from a London centric system. Part of the problem is not just governments but the underlying system of Oxbridge and the old pals corporate network. You will of course still have an element of that, but at least you will have a greater level of control as a small nation. That is the rub for me, I feel utterly powerless living in the NE, all the big decisions are made in the south, we are portrayed in the media in a negative manner and only get a fraction of the funding that the south gets - ring any bells? Disagree with you (above post), as I to live in North East England, Newcastle Upon Tyne. I would hate to see a frontier form across the border hills, statistics indicate that many people in Scottish borders wish to remain in the UK as they have close association with Cumbria and Northumberland. I do not like to see the rise of nationalism and the us and them mentality that has inevitably brought with it. The UK is stronger together, there is too much ingrained cultural and economic not to mention military integration. My previous post I deleted as I did not wish to become embroiled but hey ho.